The very rapidly arriving smart electric vehicle industry, now worldwide, has arrived just in time to offer the exact traffic solution Honolulu needs to save Billions and offers the best possible commuter traffic relief, nearly all paid by private industry! This is the Public-Private Partnership funding everyone has been looking for! The Smart Electric Vehicle marketplace is taking off like a Space X rocket. The Smart high technology companies like Google, Apple can come to Hawaii and help us make this happen. Ford and General Motors are investing heavily in this rapidly growing new smart transit market and help the state achieve the goal of all renewable energy by 2045. 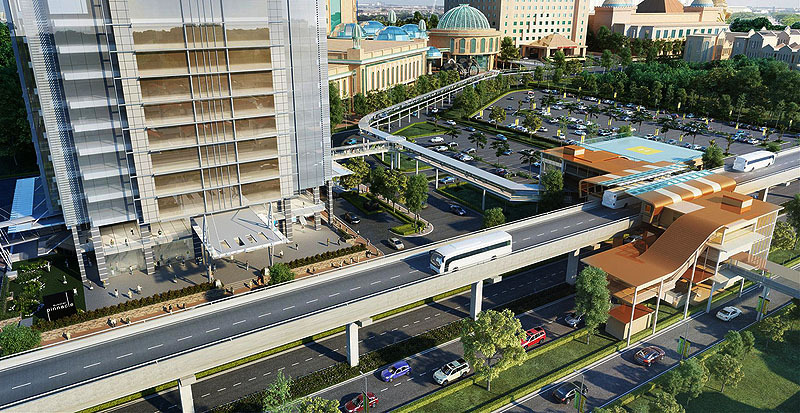 Malaysia is one of the first nations to go with Electric Buses on an elevated guideway! The State of California, San Bernardino Council of Governments, and partners at Daylight Transport and BYD Motors have announced the arrival of the first of 27 zero-emission electric yard and service trucks in three disadvantaged communities in Southern California. The demonstration truck project is part of California Climate Investments, a statewide program that invests in reducing greenhouse gas emissions, strengthening the economy and improving public health and the environment. By converting the existing built rail guideway with the precision computer control of smart electric vehicles and the best of all possible pollution free traffic alleviations worlds can be achieved. Further, Smart Electric Vehicles are the perfect high technology fit for investment and job opportunities in science, technology, engineering and math, also known as STEM, to prepare Hawaii for the future. Honolulu residents can save billions in taxes and fees, create high technology jobs and actually ENJOY commuting to work in the most comfortable way possible. Rail is not now projected to produce any passenger revenue until at least 2026. 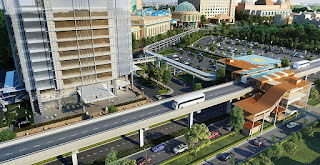 However the existing guideway can in fact be converted into managed Smart Highway lanes that are computer controlled and operated with lane use restrictions and electronic tolling to optimize traffic flow and vehicle throughput. This can be far easier and much sooner than most imagine, possibly by 2020-23 with many smart technology companies and engineers willing to help, solving H-1 traffic congestion and earning the City and State Smart Electric Vehicle revenue literally in just years. In the growing debate about the incredibly skyrocketing and completely unknown final Billions in costs for rail it has been suggested that the project just stop and the guideway could be either knocked down -OR converted into a rubber tire rapid transit guideway. Is this feasible? 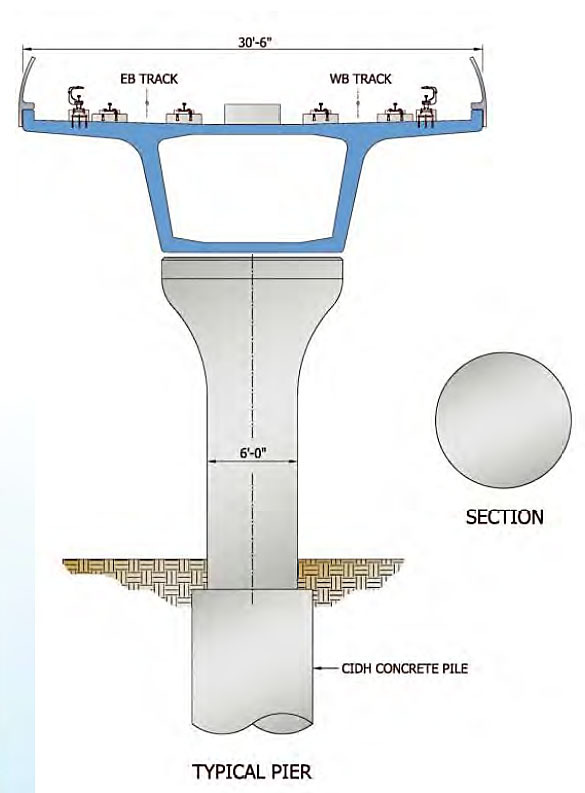 Surprisingly converting the guideway into a roadway could very likely be the least expensive money saving alternative to make best use of the already built guideway- which still lacks all stations and any type of very expensive electric power system, among other important operational requirements. To say that the rail project is 50% completed is completely untrue as only part of the guideway and some rusting rails have been installed. Rail cars currently cannot move unless pushed or towed back and forth, as has been demonstrated. Major very expensive issues and many years remain to actually power an operational rail service- 2026 at minimum. The Plinthless Rail Guideway Makes This Smart Conversion Even Easier! 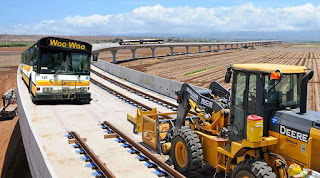 Kiewit construction made a fortuitous construction decision with the West Oahu rail guideway contract (while also losing millions in unrecovered costs) with the now fortunate decision to choose a CHEAPER Plinthless rail guideway attachment system which affixes the rail directly to the concrete roadway of the guideway with a plastic shim. This is actually very questionable for long term rail maintenance costs and Kiewit has already been required to replace nearly all of the plastic plinths at least once. They are among the first things to break in the future. The good news is that because raised hard concrete Plinths were NOT used makes removal of the rusty track much easier in conversion to a rubber tire open roadway for Smart Electric Vehicles. Once the blue plastic shims and rusty rails are removed the concrete guideway is nearly road ready! Smart Electric Vehicles will revolutionize all concepts of Public Transit and Transit Oriented Development and Honolulu has the opportunity to be a part of this amazing transit revolution. Less than 3 years away by 2020 as a major world transportation market and under extensive testing and development right now, these concepts will change everything about how people will go to places in Hawaii. In 5 years Smart Vehicles will be as ubiquitous as cell phones today and the marketplace driven by Social Media. The Rail environmental impact assessment study (EIS) evaluated whether an elevated rail transit system was the only option to solve the transportation problems of the city. Four options were considered in the study - a no-build alternative, a transportation management system, express buses operating in managed lanes and a fixed guideway transit system. The EIS concluded that a fixed guideway transit system would be the best and most cost-effective solution for serving the long-term needs of the people of the city. Note that the EIS did not specify 19th Century RAIL- (which was a later ramrodded decision of then Mayor Mufi Hannemann) - just a grade separated fixed elevated guideway. The current EIS remains valid for the elevated guideway sections already built that can now be adapted for use by 21st Century smart electric vehicles. The Airport to Downtown segment is in an identified FEMA, NOAA, UH-SOEST Sea Level Rise, Tsunami and Hurricane Storm Surge flood disaster zone that will cause loss of lives, property and valuable important Critical Infrastructure through City negligence and malfeasance. This why the guideway should stop at Aloha Stadium. Conversion NOW of the fixed guideway to Smart Electric Vehicles is the best possible alternative with 21st Century Smart electric vehicle transit technology now on our doorstep that is precisely in tune with Hawaii’s goals to be using 100% renewable energy sources by 2045. HART Rail will NEVER be able to meet renewable energy goals by 2045 because of rail traction power electricity requirements. 24/7 20 hours a day is way too high of demand for direct solar or wind energy and even with battery storage, would be massively expensive if even feasible. 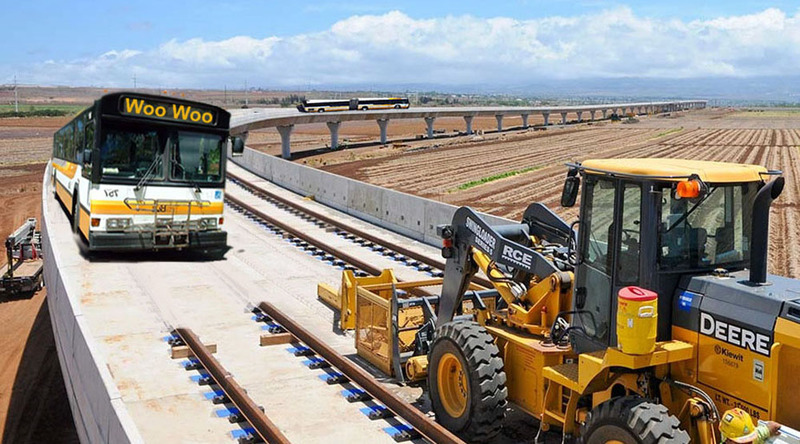 When and if Honolulu’s more than $6 billion rail transit project is fully realized, the county will be the largest consumer of electricity in Hawaii, the chairman of the Honolulu City Council, confirmed to PBN. Smart electric vehicles are mostly privately owned and operated and can be powered from home rooftop or parking garage solar panels and run for hundreds of miles saving Oahu tax-payers from subsidizing it. HART has told the City Council that the majority of rail riders (70,000 trips per day) will come from our bus system. Therefore it makes the most sense to save billions in taxes and fees and keep bus riders in single transit mode Smart Electric Buses and vehicles powered by renewable electric energy using the existing elevated fixed guideway. Conversion of the guideway to Smart Electric Vehicles and ending at Aloha Stadium will take huge numbers of vehicles off H-1 freeway as well as saving billions in construction costs, unnecessary city blight and massive rail maintenance and operations costs. No largest electric rail power bill in Hawaii history needed and entirely avoidable. It is truly dumb and outright governmental malfeasance to spend another $6 billion to $9 billion for a 1 or 2% improvement in traffic at an annual financial cost of $130 million, $500 million a mile guideway construction and permanent harm to our environment not meeting renewable energy goals. That’s really dumb if not malfeasance and criminal. 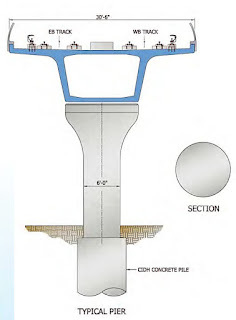 Conversion to a rubber tire fixed elevated guideway would be the cheapest alternative and most effective use of the existing built structures of all possible alternatives. 19th Century Steel on Steel that HART is using causes wear and tear from friction from wheels on rails accelerating rail vehicle and track plinth shim wear as well as making much more noise even with guideway noise barriers. Steel on Steel screeching will be especially noticeable late at night and early morning. Electric buses are extremely quiet and lack of noise from their powertrains, one of the many reasons Cities are buying them. In fact electric vehicle powertrains are so efficient and reliable, with only a few moving parts, that that some manufacturers are offering lifetime warranties. An At Grade rail route (street car and trolley) may be still applicable in downtown areas. MagLev is a great technology but remains widely unsupported in the United States and requires an electricity grid. Smart Electric Vehicles can be totally off grid, self-powering, extremely quiet and extremely route flexible. New fast electric charging stations can power up public transit vehicles in just minutes. At grade electric smart vehicle access to the guideway is available by Leeward Community College. 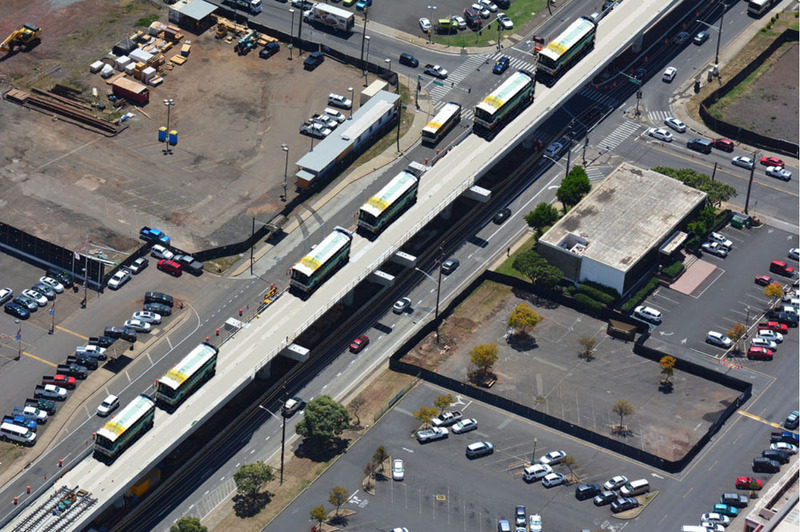 The State of Hawaii could likely fund additional elevated guideway on-off ramps with DOT Federal Highway Administration (FHWA) funds. 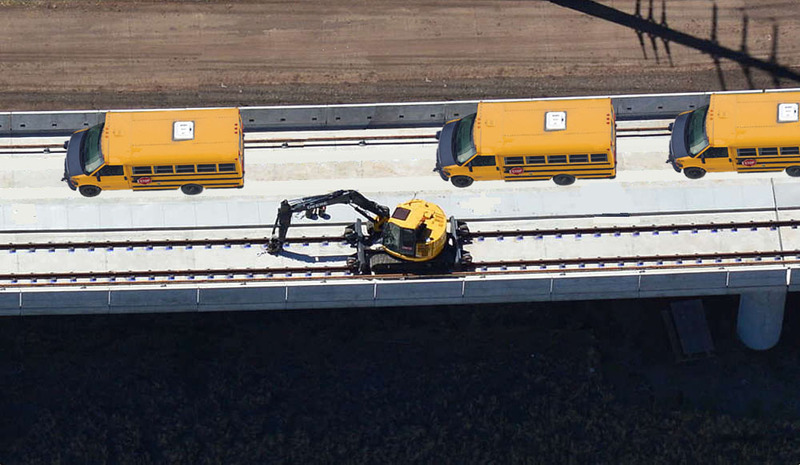 Best of all the existing rail guideway contractors already have the necessary equipment and casting yard to make the required on-off ramp conversions. 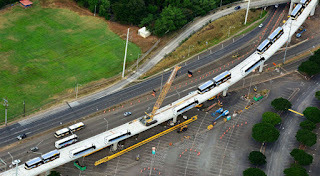 Everything is already in place and ready to be contracted out saving Billions by stopping rail at Aloha Stadium. Smart Electric Vehicles can pay any City-State tolls, registration fees, insurance, etc. electronically. Smart Electric Freight trucks are zero-emission electric vehicles for fleet markets, municipalities, universities, and state and federal government. Money saving and instant City and State Revenue! At Aloha Stadium there would be room to provide concrete guideway access ramps that would allow Smart Electric Vehicle vans and buses to drive off the guideway and continue on to Joint Base Pearl Harbor, Tripler, Camp Smith and Fort Shafter, taking at least 80% of military, defense and government workers off of most of H-1 freeway, out of the major choke point traffic merges and directly to their jobs in 15 to 20 minutes! 30 minute to 1-2 hour commutes to work would be a thing of the past. 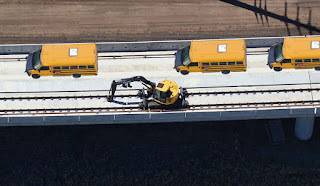 The use of GPS (Global Positioning System) and Smart Electric Vehicles would be almost identical to the original HART rail concept in that smart vehicles can be driverless, follow an exact “virtual track” with high precision and be computer controlled from a traffic operations center. Every Smart Electric Vehicle on the guideway would appear on a live electronic map. Every “advantage” HART Rail purports to have will be completely available with Smart Electric Vehicles but at a small fraction of the operations cost. 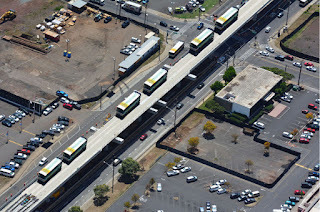 If Aloha Stadium was used as a Smart Electric Vehicle transit center with on-off ramps, Joint Base Pearl Harbor workers would be at their jobs – from West Oahu – in approximately 15-20 minutes. Aloha Stadium also offers reestablishment of the cross Pearl Harbor ferry which ran successfully without accident for over 50 years. This would provide an additional H-1 traffic mitigation route from West Oahu to Joint Base Pearl Harbor Hickam and Kamehameha Highway. Stopping rail at Aloha Stadium and converting the elevated guideway to Smart Electric Vehicles would be within the existing Rail EIS and Hawaiian iwi burials would likely not be found because archaeological surveys have already been conducted at Aloha Stadium and the elevated guide way could be finished with the existing available budget. Buses or a street trolley rail could continue on to the airport, Middle Street and downtown. Middle Street and downtown are in well-known flood disaster zones. 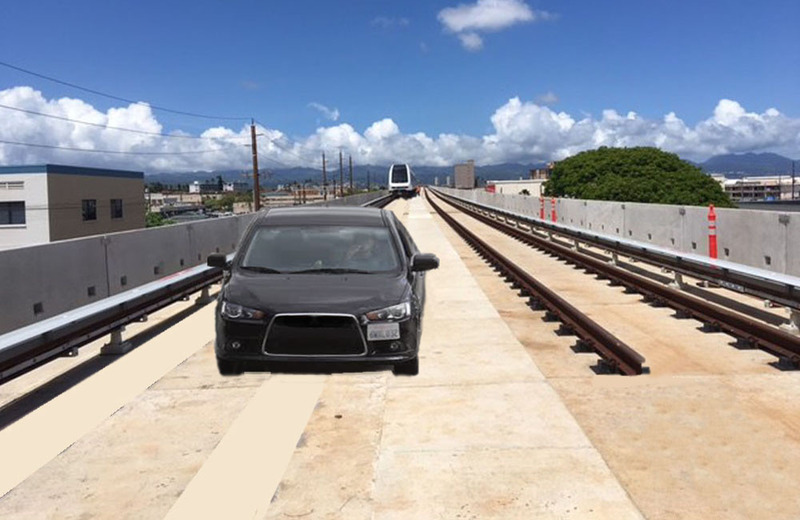 The elevated rail guideway to Ala Moana is an easily predicted construction fiasco, becoming a vastly unpopular traffic nightmare and financial black hole sucking up huge amounts of construction money in swamp lands while severely damaging the entire historic character of Honolulu. All of this disaster can be avoided saving Billions. The airport and Middle Street are in major FEMA, NOAA and UH-SOEST identified Sea Level Rise, Tsunami and Hurricane Storm surge flood disaster zones. The ground water table is very close to the ground surface and in the not too distant future Honolulu airport will see ocean water crossing the runways at high tides. A tsunami or Hurricane storm surge could do all this in just a matter of hours. There are ZERO plans to mitigate for this. Middle Street is already very well known for flooding and just recently City HandiVan buses were caught and badly damaged in a heavy rainfall flood after a close passing hurricane. The City lied and committed perjury in three places in the rail EIS about the rail project’s final segment not being in an identified tsunami flood disaster zone. The tsunami flood original maps were publically issued in 2010. City and State “planners” and contracted civil engineers still widely act ignorant about these facts. Unfortunately despite all of the evidence the City and Pro-Rail construction groups fight furiously against the best interests, safety and fiduciary responsibility to the tax paying public. Their agenda has been most expensive rail project possible for maximum profits and carelessly allowing massive disaster Critical Infrastructure losses ignoring huge amounts of best scientific studies, maps and data. 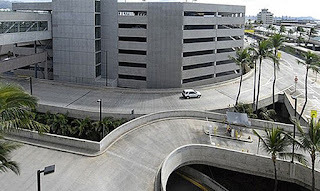 To make this conversion ideally useful for West Oahu commuters (Leeward Coast, Ewa-Kapolei) concrete guideway access ramps should be constructed where the UH West Oahu station is planned with massive thousand car parking lots. These massive car parking lots would be completely unnecessary. Instead East Town Bound Smart Electric Vehicles (City TheBus operated or private) offering a variety of low cost public Electric bus, van pool transit, Smart Electric Handi-Van to even more luxury oriented home to office van and bus services would pick up passengers in the Leeward Makaha-Waianae-Nanakuli and Ewa-Kapolei communities and go to the Kualaka’i Parkway (North South Road) elevated guideway access ramps. The guideway use would only be for Smart Electric vehicles, not gas-diesel powered. These Smart Electric Vehicles would proceed East Town Bound and could then get back onto H-1 by Leeward Community College where there is At Grade guideway access, or go on to Aloha Tower. In the afternoon the Guideway would be used in the West Leeward Bound direction. Because there would be two lanes available on the guideway it could be configured for either bi-directional traffic of two lanes in just one direction. The current H-1 Zipper lanes would still be available for more traffic mitigation. H-1 vehicle traffic congestion would be significantly reduced every commuting day for gas-diesel powered vehicles which would be gradually phased out of existence by 2045 as all new vehicles sold would be electric by 2035. Most HART Rail stations are not needed, are overly expensive, will be maintenance and security intensive, and most if not all will have any overhead covers. Most now may not actually look at all as publically advertised, lacking many expected commuter features- maybe one elevator, one bathroom. All will require massive change orders currently being hidden now from the public to make rail costs appear LOWER NOW when in fact massive expensive revisions and additions will be required LATER. Many criticized the EIS for not further discussing bus rapid transit and toll lanes, options mostly brushed aside earlier by the City in its Alternatives Analysis which overwhelmingly, for purely political reasons, chose 19th Century Steel on Steel rail. Conversion of the elevated guideway to a rubber tire reversible managed HOT lane concept would now actually be what many originally wanted in 2008. Conversion from rail to a rubber tire fixed guideway is not only relatively simple but is far less expensive than any other Rail Fiasco proposal so far. Tearing it down costs a billion or more according to HART, while continuing on costs many unknown Billions more. Conversion of the guideway to Smart Electric Vehicles allows for the lowest cost primary aim of the original project as presented to the public which to is to offer high-capacity rapid transit in the congested east-west transportation corridor of H-1. Fortunately 21st Century Smart Electric Vehicles have arrived just in time to save Honolulu Billions- if an intelligent political leader can be found. Current rail stations can be either deleted from the project saving huge amounts of money or adapted to Smart Electric Buses. 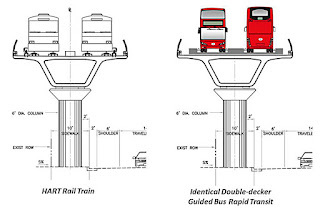 Basically this requires either lowering the station boarding platforms or raising the station entrance ramps a few feet so that riders can board as they do at regular bus stops. Dangers of falling on electrified rail and electrocution can be eliminated. Electric Smart Buses at $900,000 can perform exactly the same purpose as $4.2 million heavy rail cars. 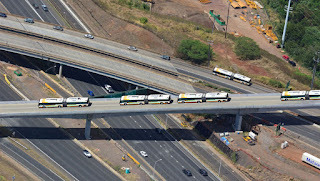 One great possibility that could bring in even MORE instant City and State revenue from a smart vehicle guideway is allowing Smart Electric Freight Trucks using the guideway during off peak hours for truck freight shipments between Honolulu, Aloha Stadium and West Oahu communities. The State of California, San Bernardino Council of Governments, and partners at Daylight Transport and BYD Motors have announced the arrival of the first of 27 zero-emission electric yard and service trucks in three disadvantaged communities in Southern California. The HART trains (according to various HART statements that vary a lot) will be able to carry 300 passengers each and transport more than 6,000 people with the number expected to reach 90,000 a day by 2030. An articulated (stretch, two-section, higher-capacity) electric bus can carry 120+ people but with far more passenger comfort and seats than the HART rail cars. 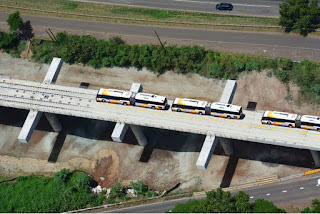 TheBus (using mostly Gillig Phantoms with maybe a few articulated diesel-electric hybrids) is already carrying 70,000 people a day now and electric smart buses on the converted rubber tire elevated guideway can easily scale up to 90,000 by 2030. Rather than running non-renewable electricity intensive rail continuously 24/7, 20 hours a day at huge expense, electric buses with WiFi, etc. can be recharged with rooftop solar panels or fast charging stations and scaled to the passenger demand, picking up people near their homes and taking them very close to where they work, without multiple mode changes. This will no doubt be the MOST POPULAR RIDER CHOICE of the 21st Century. Many cities are now buying electric bus fleets. Social Media will be wild about Smart Electric Vehicles, unique commuter services like exercise to work! Why is the City government forcing on Oahu taxpayers the absolutely dumbest and most expensive transit system possible with no accountability when far, far better lower cost, intelligent 21st century solutions now exist? Smart Electric Vehicles are basically computers on wheels with few maintenance requirements and work perfectly with smartphone apps, Lidar, GPS, allowing any type of desired commuter service to be immediately ordered up. Low cost smart van pools, smart luxury vans, smart cars, smart bike vans (pickup, drop off bicyclists) and a range of other new innovative and customizable 21st Century transit solutions that will be immensely popular on Social Media. 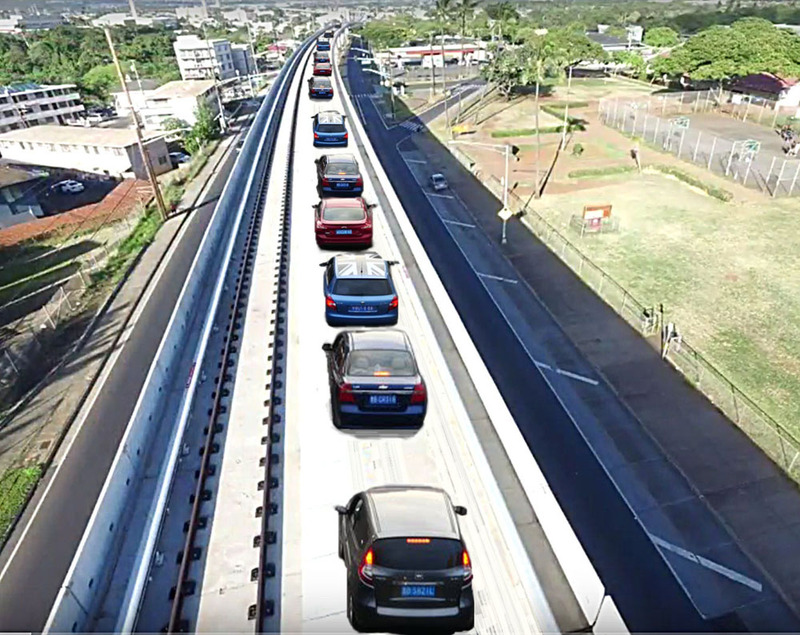 The smart electric vehicle rubber tire guideway will keep many thousands of cars off H-1 (far more than rail will) and off secondary commuter roads and highways on Oahu every day, meeting all of the goals of the original fixed guideway project concept of 20 years ago. 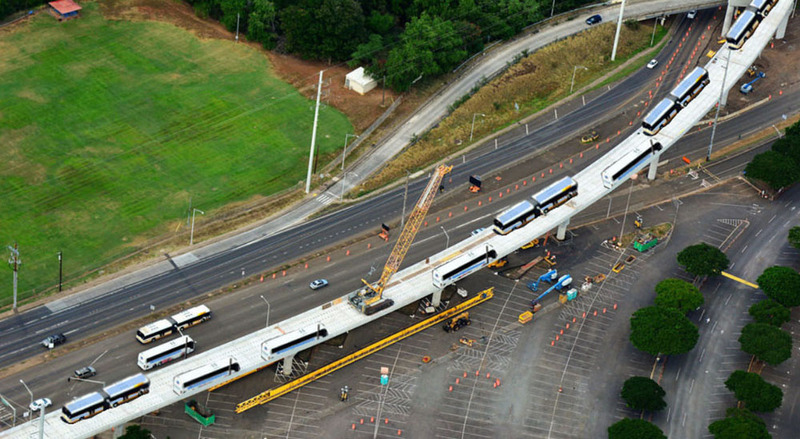 The current rail operations center and rail yard by Leeward Community College is at grade level with the guideway and can be converted into a smart electric vehicle service center and bus yard where electric powered buses can be parked under solar collectors and fast electric charging stations. The Rail will never be truly solar or wind powered because of the massive 24/7 traction power requirements and instead will require non-renewable coal and oil power. These are facts HART likes to mislead the public about as do other rail operations around the world. Instead they just buy “renewable energy” certificates that greenwash the reality of high electric traction power demands, wasteful power consuming 24/7 rail stations requiring at least 14 power plants, massive expensive electric power lines, conduits, etc. On the other hand, smart vehicles use a fraction of electricity, which is all renewable solar and can be rapidly recharged far more economically while parked. In development are rooftop solar collectors for trucks and buses allowing almost limitless 24/7 renewable electric operation without having to ever stop. 21st Century Smart Electric Buses Run On The Elevated Guideway Will Provide ALL Features And More Than Rail Can Ever Offer And At A Fraction Of The Price – And Will Be Mostly Public Private Operated! TheBus has a ridership of approximately 75.5 million boardings annually on its fleet of 518 buses, providing daily service on 110 routes. 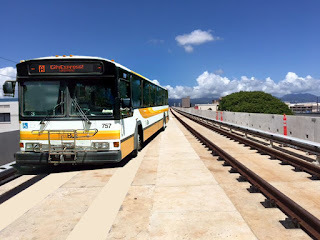 TheBus is privately managed by Oʻahu Transit Services Inc., which operates the system under a public-private partnership with the City and County of Honolulu Department of Transportation Services. TheBus has been the only mass transit system to be recognized twice by the American Public Transportation Association as America's Best Transit System for 1994–1995 and 2000–2001, beating other transit systems. The city Rail will force over 35,000 bus riders daily to transfer to rail making three highly unpopular mode changes twice day. This will drive many commuters to use other modes like older private cars. Instead of this outright stupidity and mismanagement of public transit assets the logical good government choice should be converting the elevated fixed guideway to Smart Electric Cars and Buses. Particularly TheBus which is already a City Public-Private Partnership that works extremely well! Smart Electric Vehicles user fees will be paid electronically and instantly. All guideway vehicles will be automatically insured, all fees paid electronically and instantly. All handicapped, elderly etc do not have to deal with Tokyo robot rail cars and slamming robot doors. TheBus has well trained drivers attuned to local island culture. TheBus has security cameras in its bus fleet to deter criminal activity on board the coaches, which includes assaults and graffiti where the driver can immediately stop if necessary. Due to its low cost and wide coverage, TheBus is a very popular means of travel by high school and college students students. Killing TheBus routes and service means jacked up prices for students, elderly, etc. The wealthy mayor and corrupt City Council don’t care and only want unaccountable rail taxes and fees. The HART rail stations are huge expensive energy guzzling standalone structures substantially bigger than most typical light rail stations and each contains expense artwork that must be guarded 24/7. They will be homeless and crime magnets and favorite targets of thieves, lunatics and terrorists. Bus boarding stops do not require massively expensive stations with expensive artwork that does nothing except drive construction profiteering and change order costs out of sight. Using TheBus on the elevated guideway as Smart Electric Buses maintains Honolulu’s island style traditions that everyone, including tourists like, but will also allow newer commuter concepts of luxury seats for every passenger, WiFi, etc. as found on many newer Hawaii tour buses. 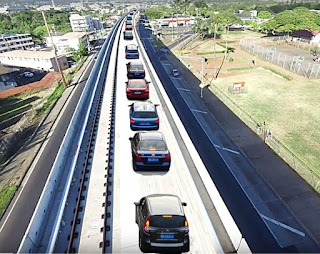 The converted guideway could also accommodate military base Smart VanPool passenger vans picking up personnel in West Oahu at their homes and taking them directly to their work places- all in a single comfortable ride. The proposed guideway conversion does virtually everything the City rail promises but far better, far cheaper, far smarter and with greater future flexibility of continuous developments in electric vehicles and software technologies from the world’s brightest minds. 19th Century heavy rail locks Honolulu into an extremely regressive dumbest possible transit solution totally out of scale for an island population. Electric buses and cars are extremely quiet, use totally renewable solar energy, are very low maintenance, unlike rail which is high maintenance, requires nonrenewable coal and oil power to sustain massively expensive 24/7 traction power requirements and produces steel on steel noise. offer a wide array of rider comfort, destination flexibility, SmartPhone apps and Social Media excitement. Rail’s section from the airport to Ala Moana is in a FEMA, NOAA, UH-SOEST Sea level Rise, Tsunami and Hurricane inundation zone. Building rail and stations there is a guaranteed disaster wasting billions in City, State and Federal tax dollars as well as risking thousands of lives. It is the dumbest most ignorant route possible based upon all best science evidence. Smart electric vehicle technologies can service all of these areas with complete flexibility to evacuate and provide emergency transportation. None of the transit assets will be lost in a disaster. Electric rail stations will be shut down and people trapped. The conversion to Smart Electric Vehicles allows for immediate emergency notifications to all vehicles with immediate redirection away from an incoming ocean disasters such as a tsunami. Even better, the smart guideway allows for use by emergency smart vehicles (police, fire, rescue, EMT) in emergencies. *All major world vehicle manufacturers rapidly developing smart vehicles. The technology has arrived. Honolulu could actually be a SMART CITY instead of one of the dumbest in the world. *Requirements: Remove tracks. 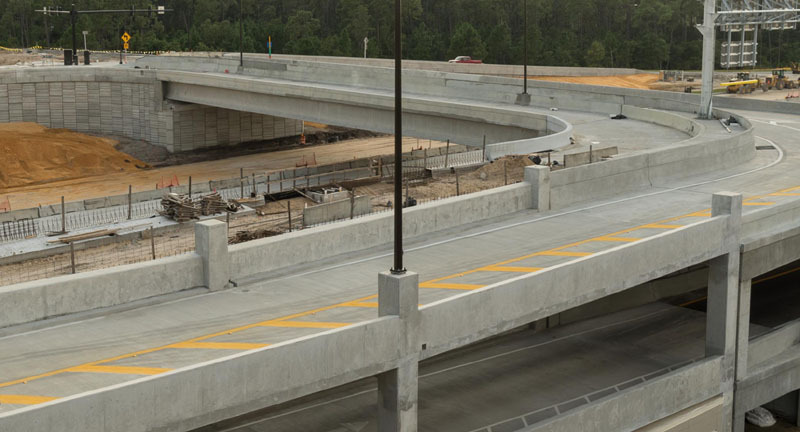 Find suitable on-off ramps. Leeward Community College at grade access already. *Provides for the best of all possible worlds based upon the present rail fiasco: Savings of Billions over rail operations. *Existing stations can be converted to bus stations or completely eliminated. Major parking lots avoided. *Riders picked up at their homes and local bus stops saving major time and cost, keeping transit riders in a single mode, no seat change pickup and delivery transportation solution. *Existing bus routes can be far more effectively combined with the fixed guideway and 21st Century Electronic Managed lanes. *The Smart Electric vehicle guideway can support two way traffic or two lanes reversible depending upon traffic needs. *21st technology Electric Cars and Buses can be driverless, GPS controlled with extremely close nearly bumper to bumper spacing tolerances creating large amounts of new roadway and parking spaces. *Smart Vehicles can see way ahead, drive around any stalled vehicles or incident/accident. Gawker slowdowns largely eliminated from main highways. *Vehicle guideways, Electric Buses can be used in emergencies to evacuate people during disasters - rail is in disaster zones, is linear and not flexible, will lose electric grid power and will be shut down. Rail Projection: Removing 200 buses from the corridor every morning will also help with H-1 traffic congestion. Instead, 200 Smart Electric buses will be off H-1 and on the elevated fixed guideway! Rail would eliminate the widely used C and E express buses that travel the Zipper lane. 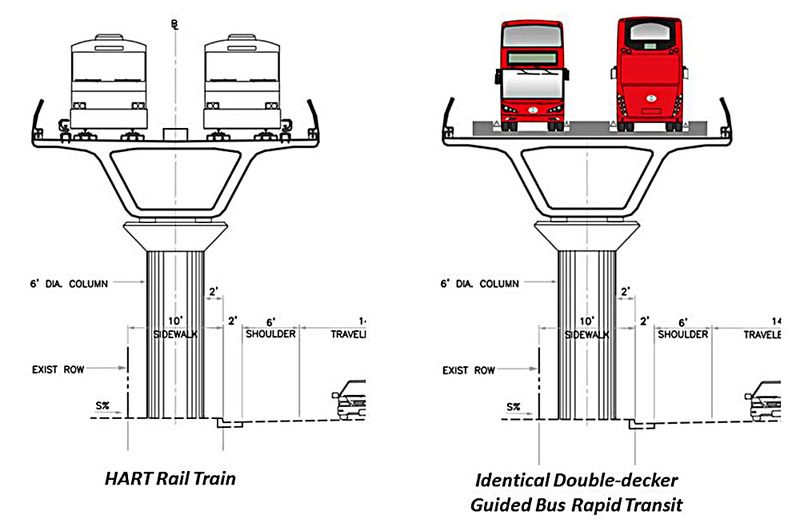 However, now those routes could become Smart Electric Buses and vehicles on the elevated fixed guideway. The Bus has already been recognized as one of the best in the US. Highly qualified, well trained bus drivers already available in both the public and private sector. Electric Buses and vehicles will employ far more than Rail which is driverless. TheBus drivers are mostly highly regarded for their Island Style attention to passengers, especially the elderly and handicapped. This is an important island cultural asset that can be retained. Electric Buses and vehicles will create unique private enterprise jobs with commuter passenger services such as bicycle carrying passenger vans allowing the best of all possible worlds for bikers. If weather turns bad, just call up a bike van to take you home. Unlike rail requiring several flights of stairs, Bike Vans can take bicyclists exactly where they want to go at the point they prefer to bike the rest of the way. Get anywhere in matter of minutes using on call Smart Bike Vans. There will even be Bike Exercise Buses (such as in Europe) which allow commuting to work on an exercise bike while reading a book and listening to music! Smart electric vehicles will offer many new commuter experiences and solutions that rail can’t and never will. This will all appear on Social Media and create many new entrepreneurial transit businesses. Smart Electric buses and vehicles will do far more to environmentally advance Hawaii 2045 renewable energy goals than rail which will always require coal and oil fired polluting power because of high traction power and 24/7 service demands. If Honolulu choses to develop a street car trolley system this proposal would mesh together far better than a robotic heavy rail system. 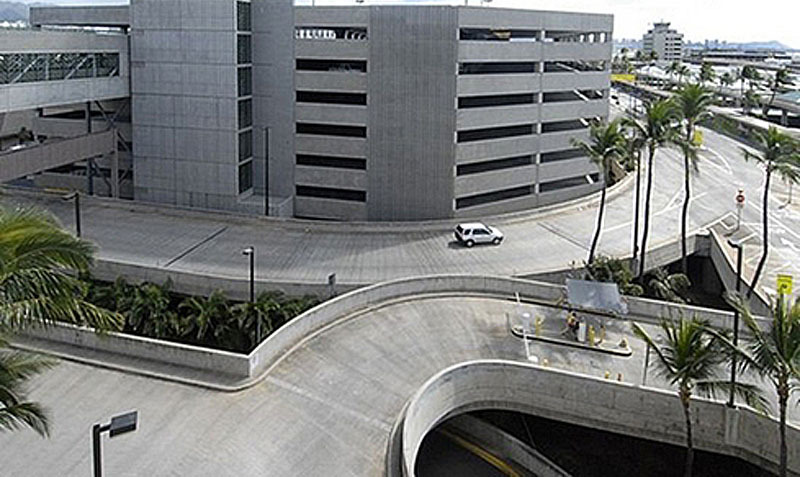 This proposal would save Honolulu from an incredible urban blight of massive concrete. “The FTA also aided the City in its dishonest efforts to convince people that rail would reduce the current level of traffic congestion. For example, the FTA publicly expressed belief that “this project will bring much needed relief from the suffocating congestion on the H-1 Freeway.” This was contrary to the FTA-approved Final Environmental Impact Statement (EIS) in which the City had acknowledged that “traffic congestion will be worse in the future with rail than what it is today without rail.” The FTA's statement also contradicted its own previous position in its January 2011 Record of Decision in which it stated: "Many commenters [on the Draft EIS] reiterated their concern that the Project will not relieve highway congestion in Honolulu. FTA agrees..."
There is still time to make SMART DECISIONS and convert the Rail Guideway To A Smart Electric Vehicle Guideway! This is an absolutely MUST SEE 53 minute video that will change the mind of any intelligent person about the REVOLUTION in Energy and Transportation HAPPENING NOW. • All new vehicles will be electric. • All new vehicles will be autonomous (self-driving). 85% of the people drive. Yet the focus is on rail and bicycles… each one about 1%... So we pay billions for rail and lose lanes to bikeways to get from 85% to 83%! Result: Too much congestion by 2030 and we’ll have lost a few lanes and several billion $ that could have been used to reduce congestion. Driverless technology is the future. Hawaii may become an early adoptee due to low speeds, uniform fleet, tourists and DUI. Driverless technologies and “automated Uber” will make public transit obsolete before 2050. An early driverless feature will be auto-parking. Cars will park 2” apart instead of 2’ apart. UH parking structure capacity can increase from 5,000 to 6,000. $5,000 more weekday revenue for UH! Need a ride? Use an app and order a driverless car or taxi. Cost to user under 50¢ a mile. Average cost to own a car is well over 70¢ per mile. The car is a large investment that for most people sits parked 22+ hours a day. Frees up parking lanes, beautification, bike lanes, street vendors. Frees up large parcels, re-development. More space for people in increasingly crowded cities. If we could have automated cars overnight, congestion would disappear overnight. They have no perception and reaction losses. They drive at uniform speeds. They drive close to each other. All 2-lane roads can become 3-lane roads. Ubiquitous autopilot for low-speed smooth flow … enhanced adaptive cruise control. Driverless BRT for core, high capacity city routes. Ubiquitous driverless pods on campuses, airports, national parks, etc. Last time we put our life in the hands of a robot car, it managed to park itself without crashing or abducting us. Robot cars also know how to drive like maniacs, and even how to power slide. These are all very neat tricks -- tricks that might save your life one day. But what's going to happen when all cars are this talented? Efficiency. Scary, scary efficiency. It's not just the sensor-driven skills that will soon be common to individual cars that will shape the future of automotive transportation, but also the ability for cars to communicate with each other, sharing constant updates about exactly where they are and where they're going. And with enough detailed information being shared at a fast enough pace between all vehicles on the road, things like traffic lights become completely redundant. Do the Netherlands’ trains really run on 100% wind power? NS claims 100% wind power because it has a contract with various wind farms to produce enough energy to power its rail system, but this is just an accounting transaction. Only a small fraction of the power delivered to its trains actually comes from wind. transfer of the rights to call electricity green from those who actually generate renewable energy to those who don’t but want to classify their power as such. other power plants in the country, and NS draws its power from the grid. At Left, Exhibit A, BAD CRACKING RAIL SHIMS- Will Return Again! http://www.greencarreports.com/news/1104496_volvo-electric-buses-quiet-enough-for-classic-music-concerts Quiet means easier to read a book, take a nap, or even listen to some live music without any bus engine noises. HART Rail has huge electric traction power demands and screeching steel wheels. UK's Green Alliance thinktank group says the combination of solar and household batteries such as Tesla’s Powerwall could result in houses being able to supply their own electricity independently for months at a time by 2025. Transport for London is spending £18m on upgrading the capital’s power grids to charge the first generation of battery-powered black cabs. Norway is the clear electric vehicle pacesetter in Europe, which now has about 500,000 electric vehicles. China leads the world in EV usage, with about 600,000 all-electric vehicles on its roads and an ambitious plan to deploy 5m EVs by 2020. The US ranks third globally, with fewer than 500,000 EVs. But electric vehicle momentum is picking up in the US, as evidenced by the 400,000 people who have paid $1,000 to be on the waiting list for Tesla’s $35,000 Model 3 car. Many experts see 2017 as a crucial breakout year for electric mobility in Europe and beyond. Yet none of the competitors matches Tesla’s leading models with ranges of more than 215 miles.